After hanging out clothes on railings along St George's Road, a laundry operator has been instructed to remove them by the Public Utilities Board (PUB). A Stomper sent in pictures of the clothes and told Stomp that he has seen the clothes hanging out multiple times. He said: "This has been going on since late 2017. "I have made multiple attempts at getting the laundry shop operator to remove the clothes, but to no avail." On Oct 23, 2017, he sent in feedback via the OneService app. 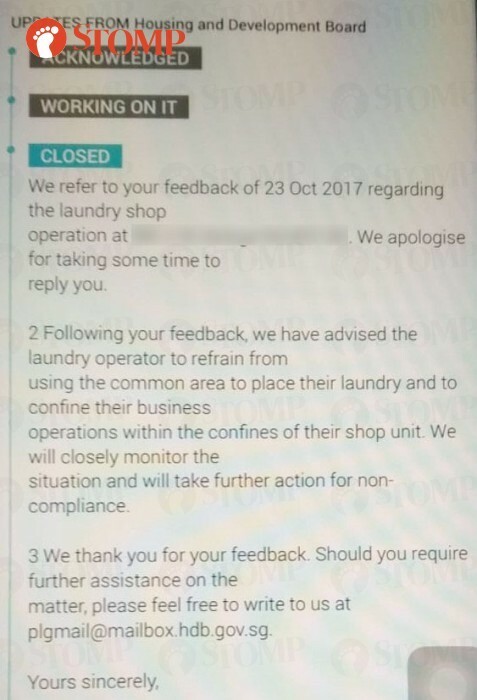 The Housing and Development Board replied saying that it had advised the laundry operator to refrain from such practices. On Aug 17 this year, the Stomper still noticed the clothes hanging in the same areas. He gave feedback via the application again and was told that the case was referred to the Public Utilities Board. Later this year on Dec 8 and Dec 15, he saw the clothes still hanging on the railings. He said: "Firstly, I am concerned about the hygiene of the clothes. "Since the clothes are left out in the open and on railings near drains, they may get dirty again after being washed. "My second concern is that they are extremely unsightly to passers-by." In response to a Stomp query, the PUB said: "The purpose of drainage railings are for public safety. "We agree with the reader that this is unsightly. 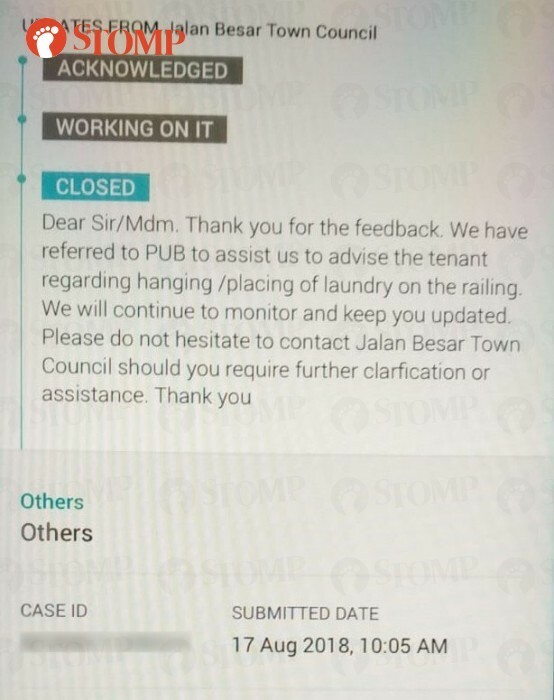 "PUB has gotten in touch with the owner of the laundry shop and instructed them to remove the clothing and refrain from hanging the laundry on the railings."